It's a rainy morning...the flowers are loving this weather and green is beginning to pop up everywhere...so as I'm nestled here working away at my desk, sipping my favorite Parisian tea, Mariage Freres I got to thinking about all of the delicious, lovely and inspirational products and goodies I've seen this week via some of my favorite bloggers, businesses and gourmet foodies...so I thought I'd share...oh, and the one little Parisian splurge was totally for my iPhone, not for me! 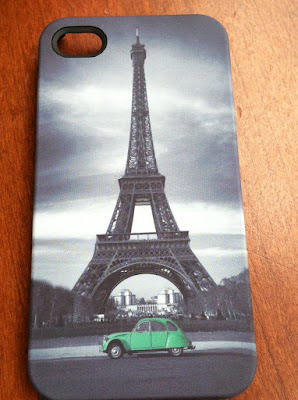 I picked up this little goody at the Apple store - the moment my eyes connected with zzzz Tour Eiffel it was mine...I mean, my iPhones'...silly. This cover, made by Venom in the UK, has a great graphic and super smooth surface that fits the phone perfectly, and will aid in the conjuring up of lovely memories from past visit(s) to Paris. Just looking at this photo I can feel and smell the Parisian air, hear the sounds of cars, sirens and boat horns tooting down the Seine. It makes me happy. A former boss and friend of mine who is also a Celiac, recently posted on Facebook that she was reading Wheat Belly by Dr. William Davis, so I had to download it and start reading. I'd heard of this book a while ago but my friend's recommendation, stemming from the horrors and truths behind what wheat is really like today in America, was too intriguing to pass by. I'm half way through and am in utter amazement of what an abomination our United States food industry really has become. I've been reading and researching more and more, digging in and learning about the hostile takeover of the worlds seeds by certain unnamed food giants ruining the health of millions. There are some terrific documentaries out there folks - just do a little searching and you'll easily find the likes of Food Inc., Forks Over Knives, Food Matters, King Corn, etc. All can be found on Netflix. I'll stop here...but I must tell you that I've developed very strong opinions about our food sources and eating organically...and though I used to question Vegans, I'm in their corner more than ever as it pertains to most foods. It would take a lot for me to completely give up fresh fish and chicken...and eggs! 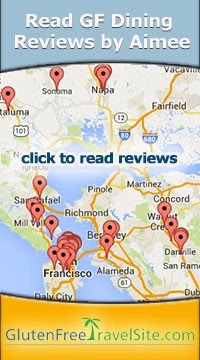 So I do my very best to research where my food comes from and try to buy organic products. If you enjoy on-line shopping for food and gluten-free treats then you'll love these suggestions. I've become a huge fan of FOOD52 and all of their wonderful recipes and product mentions. Today's news is no exception as Amanda and Merrill boast about artisanal olive oil and tea. The featured olive oil, California Olive Ranch, is already a fav of mine. I LOVE their Arbequina oil as it's so lively and fruity. 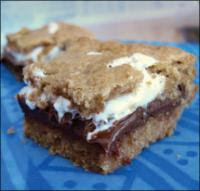 If you're in the mood for some fun baking with the kids or a treat for yourself, Living Without Magazine just posted a delicious looking GF, dairy-free S'mores Bar recipe that sounds so yummy. A perfect treat to make this weekend and you don't even need a campfire! And last but certainly not least...Market Hall Foods is talking all about a company and their products from Northern California (my homeland) that's really great...the Mendocino Sea Salt & Seasoning Company. 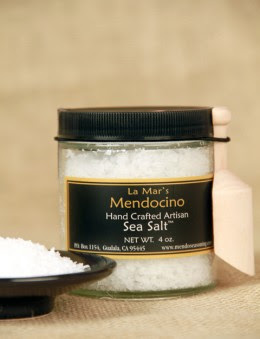 They offer three salts; Artisan, a flaky sea salt comes from the clear, cold waters off the Mendocino Coast, Nori, with local, edible seaweed, and Seasoning "Sand," a blend with garlic, onion, brown sugar and pepper. I want to try all three. Hope these fun finds and goodies bring a smile to your face and a fun package to your door. 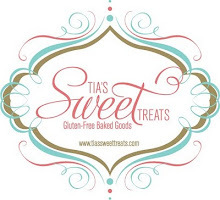 I'd love to hear about your favorite gluten-free goodies and why you love them...always looking for reader input and ideas we can post/share. to a process they can't see." Mark Nepo is truly one of my most favorite poets/philosophers and his journey is remarkable, as are his words that spring to life creating images and understandings like no other writer I have known - he is blessed and gifted. Though his life's journey has been filled with struggle, light and dark, it's what shapes his voice and gives life to the tremendous wisdom which he is able to convey by simply putting pen to paper. Every morning I begin my day reading his "The Book of Awakening," which offers daily spiritual guidance and short lessons that inspire and ask us to look a bit deeper inward as we rise to meet each day. He's simply amazing...period. Which is the reason why I had to share this reading from April 5th titled "The Courage of the Seed." It's so appropriate as we move into spring and watch nature take the lead so effortlessly, showing us all the way towards opening and crawling out of our darkness or hibernation. What a powerful lesson is the beginning of spring. All around us, everything small and buried surrenders to a process that none of the buried parts can see. And this innate surrender allows everything edible and fragrant to break ground into a life of light that we call spring. In nature, we are quietly given countless models of how to give ourselves over to what appears dark and hopeless, but which ultimately is an awakening that is beyond all imagining. This moving through the dark into blossom is the threshold to God. Mark's reading and the flowers budding all around me now reminded me of my own growth and journey, much of the path directly influenced and affected by my Celiac diagnosis which will be 11 years this week. Wow. I've mentioned this before during the life of this blog, but reflecting back now over a decade of life sans gluten is quite something to take in. There are days when I seriously feel ten years younger than my birth certificate verifies, given that for a decade I struggled so seriously to stay alive before my diagnosis. AKA...I want the ten years back - ha! Therefore, the month of April is a reminder of new life for me...the day someone finally handed me the answer I so desperately needed in order to live! Many still ask me, "oh, isn't it so hard to live and eat the way you have to,"...The answer is yes and no, as many of you will understand. But I've always chosen to see my diagnosis of Celiac Disease as a blessing, not a curse; that's how I live. What's most remarkable now is the abundance of support, products and options for us gluten-intolerant that have sprouted (sorry, I had to use that word) in the last decade. For the most part, it's really great and I just hope in some tiny way, as a "pioneer" so to speak, I've been able to help a few Celiacs who've show up with that "deer-in-headlights" look upon initial diagnosis, or at least been able to spread the word about how serious and life-changing this autoimmune disease really is. 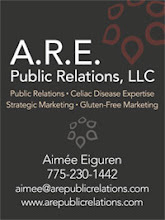 The abundance of app, tools, recipes and blogs dedicated to gluten-free living is remarkable, and the further I research and the more public relations work I do for gluten-free clients, the wider my eyes become, in awe of the GF market that's flourishing. A client of mine, Find Me Gluten Free, just this week officially announced their new app for iPhone and Android dedicated to helping users find gluten-free friendly businesses and products. It's very cool and has received great response, proving once again the need for gluten-free information and the power of sharing the news. Pass it along and keep the information highway moving towards solid and accurate reporting about Celiac Disease vs. the fad of gluten-free diets that abound. Happy Easter season everyone...remember to Bloom where you are planted!